Longtime cyclist Dennis Kruse was looking for a new project as he entered retirement three years ago. Passionate about biking and hiking trails, he took over leadership of Bike Loudoun from founder Pat Turner and helped draw up a list of goals for the nonprofit organization. Near the top of the list was creating a pilot project of sorts, and Leesburg was selected as the place to get it started. The Leesburg Loop project aimed to create well-marked bicycle network of trail connections, bike lanes, and shared-use paths throughout the town. Two designated segments of the town’s bike network—the 5.5-mile Blue Trail from the W&OD Trail in Tuscarora Creek Park to the cul-de-sac near the entrance to Ball’s Bluff Regional Park, and the 2.6-mile Green Trail from the W&OD connection near Fox Ridge Park to the intersection of Battlefield Parkway and North King Street—have gone a long way toward the goal of providing access to navigate the town on two wheels. And it has been a catalyst project for Bike Loudoun, with the assistance and buy-in of town staff, town boards and commissions, and ultimately the Town Council, which endorsed the bike network project. Remarkably, the town became the first municipality in the county to have dedicated bike lanes, and it chose the high pedestrian traffic area along Plaza Street. “It’s very difficult to steer a car that’s standing still. Leesburg allowed us to roll the car,” Kruse said. But it wasn’t always smooth sailing in the county seat when it came to bicycle and trail connectivity projects. Former mayor and Town Council member David Butler chaired a committee, prior to his decade on the council, that put together recommendations on providing such access to the town’s southern quadrants. While he said recently he was pleased with all the inroads the town has made in connecting its southernmost residents to the W&OD Trail and other areas throughout town, he hopes the current council at some point reconsiders a trail project like the Southwest Connector Trail, which never got off the ground. The 9,000-foot-long trail project was recommended by the ad-hoc committee in late 2006 and approved for funding in the 2008-2012 Capital Improvements Program by the council. The $7.1 million project would have connected southwest Leesburg with the W&OD Trail via a three-phase project that included a pedestrian/bicycle bridge over the Rt. 7 bypass. The project was later deleted from the CIP following intense public scrutiny, namely from those living near Clubhouse Drive, over concern with the overall budget and public safety impacts. Another longtime council member, Marty Martinez, is also an advocate for bike connections throughout the town. Martinez said creating these connections throughout town is “about public health” and creating alternatives to driving, for both recreational and commuting purposes. “I believe that there’s going to come a time where we focus on biking and walking more than driving,” Martinez said. Martinez has a long-term vision of creating a “spoke and hub network” where residents or visitors from anywhere in the town can access the historic downtown area and all its shop, restaurants, and destinations by bike. “I want to make it attractive not just to come into downtown but to bike around,” he said. Cyclists gather in April for the unveiling of Leesburg’s new designated bike route. Creating such connections not just to the downtown area, but in other areas of the town, may require the Town Council to step up to the plate in terms of project funding, he said. Few related construction projects are in the pipeline, although a trail across the Rt. 15 bypass at Battlefield Parkway is expected to begin construction in the fall. Development has brought some positive developments to the town’s bike network. Recently, trail connections have helped to connect cyclists and pedestrians to the Lowe’s and Village at Leesburg developments. Waiting on developers to build bicycle and pedestrian connections as part of their projects is not an issue alone to Leesburg. 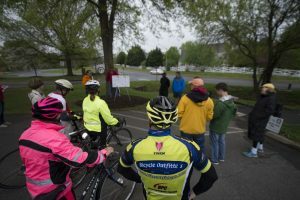 It’s one that Kruse sees throughout the county and one that Bike Loudoun hopes to find a solution for. “Everything we do is along development,” he said. But if the development doesn’t occur, many trails and bike connections become dead ends. “We’d like the W&OD to be an artery where people can turn off and get to the new Metro stations,” Kruse said. Former town Planning Commissioner Brett Burk has often used the town’s bicycle connections, especially the W&OD Trail, to commute to and from his office in Falls Church. He has seen positive change in the town not only in terms of better connections, but in attitude. Long term, Kruse said he’d like to see a C&O Canal Trail-type connection for points north along Rt. 15 via a shared-use path along the highway’s east side. The county currently has a 20-foot trail easement along White’s Ferry that will expire at the end of this year. But, if the path is created, it would connect White’s Ferry to Balls Bluff and, thanks to the Leesburg Loop, connect to the W&OD Trail. 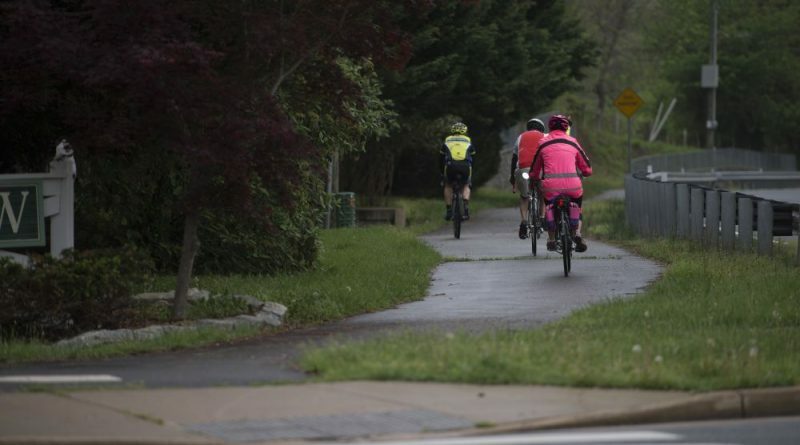 “That would be really significant for bike tourism here in Loudoun County,” he said. “You could camp or take a hotel night in the Town of Leesburg and ride back to Washington, D.C., or vice versa. This has been something that’s kind of a nirvana for us cyclists for many, many years. This is a very high priority for us,” he said. And while many, like Kruse, are thrilled with the progress in Leesburg, no one is holding up a mission accomplished sign quite yet. Under Mayor Umstaddt, the Southwest Connector Trail cost the taxpayers of Leesburg nearly $400,000.00 in direct costs such as architectural fees, plus a significant amount of other indirect costs, simply due to the failure to knock on a couple dozen doors to ask residents/tenants their thoughts in the one most affected community. Sadly, our money was treated then like it was recently treated when Mr. O’Connor got his much needed sidewalk widened downtown on our dime too (of course legally, but through his pals Kelly and the rest of the gang who voted in favor of it – and Gwen who pushed for it all those years – and Kristen while she was on the BOS’s). Always a laugh when I see Leesburgsfinest(not) comment. One thing is always sure about him, facts do not matter much to Leesburgsfinest(not). First off, then Mayor Umstattd opposed any such “Southwest Connector Trail.” I guess poor leesburgsfinest(not) still seems to not understand that on a council, or board of supervisors, the majority of votes control. And once again, he seems to overlook the fact that Tom Dunn refused to support then Mayor Umstattd to cut the funds for the waste of money project of widening the sidewalks in the downtown, when she made a motion to cut that project. And it is beyond belief that leesburgsfinest(not) would believe that a sitting board of supervisor member somehow gets a vote on the Leesburg Town Council. Leesburgsfinest(not) is in serious need of a civics lesson. Laugh/Lawgh – let me simplify things for you as over time, and your age, it must difficult. Ms. U, who at the time, initially supported the AdHoc committee to oversee looking into the SW Connector trail. She was, at the time, Mayor of our Town, and it was a very, very expensive operation that included many neighborhoods including some across from the airport, but ironically, not the apartment community right next to the golf course for some apparent that perhaps Dave a Butler can discuss as it would be most affected. Once the folks from that community got into an uproar, the budget(s) for the various phases of the projects were known, and economy was faultering significantly, the proposed project was tanked….. In regards to the downtown sidewalk project, Ms. Burk (Our Mayor) and Hamler, and Mr. Butler and Martinez voted for the project, which was something that Gwen Pangle, and yes Kristen, had been working on for years and years, which was a direct favor to their friend Michael O’Connor and one of the biggest wastes of taxpayer money in the history of our Town. Whether or not Kristen is in office or not, she is best friends with Kelly and Gwen, and in essence, in office (although she gets no vote, she still is a massive voice in this town). They all meet very regularly, as you are fully aware, with other local and regional “friends”. FYI… sometimes a no vote is actually a yes vote when you know everyone else is voting yes. It’s especially true when your “friends” are Developers (or if you need to appear to vote no…..). Just ask the likes of Gwen Pangle, a real estate business owner, and best friends with Kelly …….. It makes you wonder when their are only 5 projects on the developers list (other article), and the next strip center is being readied for sale and being demolished, and new condos being built shortly. No civics lesson needed.